JK Lakshmi Cement Limited is a part of over 132 years old JK Organisation. An eminent industrial house, with operations in India and abroad and having a leadership presence in the fields of tyre, cement, paper, power transmissions and sealing solutions, dairy products and textiles. JK Lakshmi Cement (JKLC) was set up in 1982– in a village in District Sirohi, Rajasthan. Today, the company stands tall with an annual turnover of about Rs. 3000 Crores and an impressive production of 13.30 million tonnes per annum. JK Lakshmi Cement is the strength behind structures that India is proud of – Indra Gandhi Nahar Pariyojna, Sardar Sarovar Project, Golden Quadrilateral , Mundra and Kandla Port stands to name a few. It partners India’s leading corporations such as L&T, Reliance, NTPC and Essar to create the new India’s success story. It is the brand choice across all section of customers such as housing projects, roads and bridges , airports , factories and as well as the individual house builder (IHB). Behind these numbers and achievements lies a story of grit, perseverance and a thirst to excel through innovations in products ,using world-class technology , excellence in manufacturing by being the least cost producer , a robust marketing and distribution network ; and the heart to give the society an opportunity to grow. The true spirit of a leader lies in constant innovation and not resting on one’s laurels. 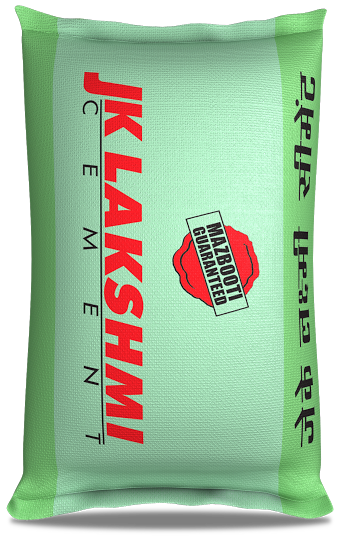 JK Lakshmi Cement proves it with “JK Lakshmi PRO+ Cement” in an all new avatar. The idea to develop cement with superior qualities germinated in early 2014. A team of experts was put together to analyze what the consumer wants. Once the latent needs of the consumers were identified, the team further studied best manufacturing practices across the globe in order to fulfill this needs. The result? A cement with 7+ astounding benefits in terms of strength, durability, finish, setting speed, quality assurance, service and economy. 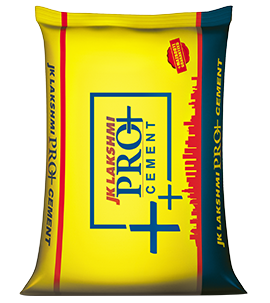 Today, JK Lakshmi PRO+ Cement is the talk of the town by being the best-in-class product and has become the first choice among customers. Dealers across India have shown an unprecedented enthusiasm and excitement towards this product. A leader has the ability to think ahead of his times. For long, JK Lakshmi Cement’s felt that traditional red bricks needed to evolve. Hence, it came up with JKSmartBlox - Autoclaved Aerated Concrete Blocks. A green product- it replaces traditional bricks , which uses cultivable top-soil and also consumes very high energy during its manufacturing process. JKSmartBlox is manufactured using fly ash, a waste product and is manufactured using world-class German Technology. They weigh less, are larger than traditional bricks and easy to work, with their unique tongue and groove feature. The result? Projects can be completed faster and with a better economy. What’s more, JK SmartBlox is also environment friendly as it offers better insulation allowing substantial energy saving. The concept of coloured bags for product differentiation . A waste heat recovery power plant. Introducing OPC 43 grade cement in North India. The Excellent Energy Efficiency Unit Award. Its people come first for JK Lakshmi Cement. The company undertakes several initiatives in the areas of Training and grooming young talent. No wonder, JK Lakshmi Cement is one of the ‘Great Places to Work’ in an Economic Times survey. The company’s wide network of 200-220 cement dumps and over 7000 dealers across the states of Rajasthan, Gujarat, Haryana, Delhi, Uttar Pradesh, Punjab, Jammu and Kashmir, Madhya Pradesh, Chattisgarh, Odisha, South Bengal, Vidharbha, Mumbai and Pune, ensure that its products and services reaches millions of customers. It has been named as amongst top 100 most Admired Asian brands and has won the MTM Corporate Star Award for programmes for its business associates . The company has come up with various innovative initiatives in rural marketing which won several accolades from RMAI (Rural Marketing Association of India). JK Lakshmi Cement not just reaches the door steps of the consumer, but also has been able to build an emotional connect with them through its various media campaigns. JK Lakshmi Cement’s baseline ‘Mazbooti Guaranteed’ brings alive the company’s motto and builds an instant connect with the consumer. Keeping up with the digital revolution, JK Lakshmi Cement was among the first cement companies to get into this area. In fact, its Facebook page has almost 2.5 lakh likes, one of the largest among all cement companies in the country and abroad. Apart from Facebook, the company also reaches out to it's valued customers through different digital media. Adult and Women Literacy Programmes for families in Sirohi Rajasthan. Sahyogi Sanrakshan Club for masons. The club offers insurance to masons, thus securing the future of their families. Smt. Vinita Singhania – Vice Chairman & Managing Director - JK Lakshmi Cement honored with ET NOW CSR Leadership "Lifetime Achievement Award " 2018. Over millions of satisfied consumers, many awards and recognitions fuels the motivation of Team JK Lakshmi Cement to reach still greater heights. Each day ushers a new promise, a new idea and a new journey. And as we all know, the story has just begun.